Will Guyana Survive the Great Flood? When I was a kid in Georgetown, capital of Guyana, flooding meant a day or more off from school. During the rainy season, it was quite normal for drainage canals to overflow into streets and neighboring yards. 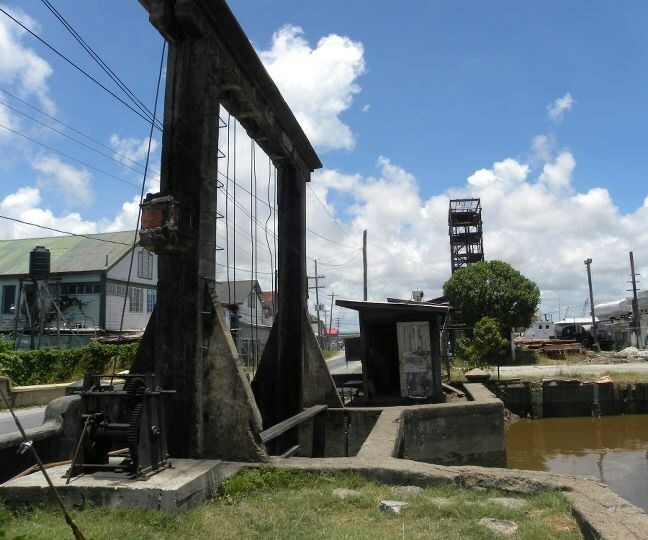 To drain the flood water, kokers or sluice-gates could not be opened until low tide. 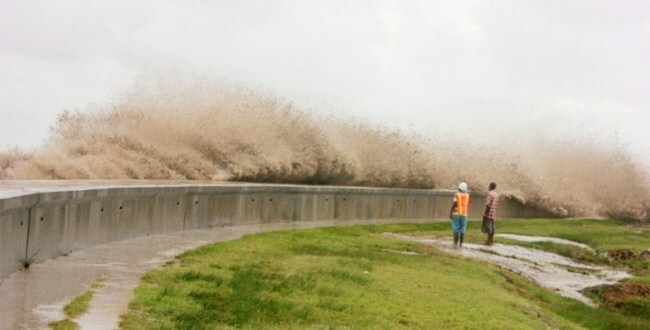 Over the years, flooding along Guyana’s 264-mile-long, low-lying coastal plain has intensified. This is due partly to failure in upgrading the sea defense system built in the 1740s under Dutch colonization. But the main culprit has been the rise in sea levels. In a country where over eighty percent of the population lives along the coast, ranging from 20 to 40 inches below sea level, this is cause for concern and an action plan. Evidence on the ground and from outer space indicates that Earth’s polar ice caps, Greenland, and mountain glaciers worldwide are melting. According to research done by Evan Persaud of the University of Guyana, the mean sea level rise for Georgetown is 9.25 inches over the past fifty years; greater than the global mean sea level rise of 7.9 inches for a hundred-year period. In a stunning chart, National Geographic depicts rising sea levels from AD 1 to 2013, plus four scenarios for the period 2013 to 2100. Their aerial global map, If All the Ice Melted, shows the world’s new coastlines. Georgetown and most of Guyana’s coastal plain would be inundated. Remaining on the coastal plain will be costly. As one of the founding members of the Caribbean Community (CARICOM), Guyana is not alone in facing the threat of rising sea levels. Seven small island member states already face critical economic losses from climate-related disasters to their tourist industry, agricultural lands, and infrastructure. Raise your voice, not the sea level. Planet Earth is our shared island. Let us join forces to protect it. Can Guyana’s racially divisive leadership join forces to protect the nation? Based on their record to date, I think not. “Guyana pays US$3,500 to build one meter (3.28 feet) of sea defense,” Kaieteur News, Guyana, June 6, 2014. You’re the best! Much appreciated. Weather forecasters Saturday night warned that there could be flooding in some coastal areas due to heavy rainfall coupled with the Spring Tide. “Flash Flood warning is in effect for flood prone areas within Regions 1 to 4,” according to a weather bulletin issued through the Ministry of Agriculture. Forecasters said a lot of the rain is expected to in southern Region 6 as well as Regions 8,9 and 10. “Coastal regions will also be affected but should have less rainfall than the hinterland,” said the advisory. Thanks for sharing the latest news, Cyril. Local residents have to brace themselves for worse to come in the days, months, and years ahead. The issues were partly answered. Could Guyana divisive leadership come together on such an important national issue. I have doubts but hope I am wrong. One big issue is where would they build the capital and center of national administration. Imagine seeing that new hotel near sea walls flooded to the X floor. Albert, I, too, hope that I’m wrong. Determining a new location for Guyana’s capital and center of national administration would be the responsibility of Guyana’s leadership. My suggestion would be the Kanuku Mountains in the Rupununi Region. However, I have no knowledge of how this region will be affected by rising sea levels. Given Georgetown’s vulnerable coastline, the new hotel is a risky, short-termed venture. If it survives the pounding ocean, I imagine it partly submerged and teeming with sea-life. It is. Thanks for reading, Dr. Stein. I don’t want to sound facetious, but has anyone given any serious thought as to what would become of Old Georgetown, and its environs should the capital be shifted inland? Just to engage the liberty of one’s imaginations, is it possible that we could be transforming Georgetown into a world famous natural waterway, (viz. “The Atlantiguya Waterway”), that ebbs and flows at the mercy of the Atlantic. Just think of the enhancement to the tourist industry, and the coins that would enter the country’s coffers, as well as the pockets of the “rogues”, as visitors caress the astonishing view with their eyes. Added to this, sightseers can stroll hand in hand along the seawall, playing possum with the rushing ensuing waves on the Atlantic side, as it makes its way over the remains of the wall, and majestically falling into the bosom of the waterway on the other side: all can play, no racism or sexism allowed. The new floating hotel would be docked beside Freedom House, where all coins would be safely deposited, with or without receipts. Hello Ministry of Tourism, you’ve got the Grand winner here, in your backyard, and the solution to all the country’s ills. As Kamptan has suggested on the Guyanese Online forum, historic buildings like the Georgetown City Hall should be dismantled and relocated to the new capital. Given the degree of corruption in the country, I don’t believe any building will be left standing for use as a tourist attraction. Everything of value would be pilfered. By the way, who might the two folks be, in the picture above, the ones taking in the view of the cascading waves over the wall? Could it just be the reincarnated Jagan in the yellow top, and Burnham, in the “pants flopsy”? Wow, the jumbees are everywhere. “I did tell you we should-a raise the damn wall,” one jumbie said to the other as they watched the waves cascade over the seawall.